Home » Homepage » Not yet a party but soon? Since I didn’t expect much, I wasn’t very disappointed. I know I have an underpowered laptop (my so-called “main computer” is so old and broken that it’s been endlessly attempting to repair itself), so no wonder this doesn’t look as nice as what other users have been seeing in Cloud Party. Now others have extensively reported on Cloud Party’s functionality, features, looks, and so forth. You can get a list of more to read on avatarium.se; it’s a Swedish blog, but the links are mostly to articles in English. Of particular interest is the one describing the technical aspects of Cloud Party written by the peerless Nalates Urriah. These will be important for all the “comparisons” in the next few weeks. It’s interesting to see “Cory’s hand” behind CP. IMVU, who has more than twice the user base of SL (or more), focuses on avatar personalisation, and that made them financially rock-solid as dozens of thousands of content creators design the awesomest pieces of clothing using mesh — years ahead of SL. Still, the engine doesn’t do wonders, and at the end of the day, IMVU avatars just look slightly better than SL, even though all clothes, hair, etc. have always been meshes. You can create your own rooms in IMVU but it’s painful, hard work, best left to professional developers. Blue Mars focused on stunning graphics and allowing professional developers to deploy their models there. As such, things looked much nicer than SL, but it was hard to personalise everything. Kaneva tried to create a social networking tool first — you had to participate for weeks on their forums etc. before being allowed to register — and then gave you the doors to a VW which looked a bit better than There.com but not that much better. CP is true to Cory’s beginning love in SL, in 2002: give them great building tools, and who cares about the avatars or the remaining things that make up a VW — let the builders build, let the designers design, let the programmers programme, and everybody will be happy! And, indeed, the reviews from SL content creators have been all highly positive so far. They’ve noticed one or two limitations here and there, but for something that allegedly has been done from scratch by a handful of developers in barely nine months, it’s impressive work. 1) Content creators are just 1% of SL residents. One might argue that new content creators would come just for CP, who would never consider going to SL/OpenSim. Well, after so many years watching these social VW popping up and disappearing again, I have noticed a few trends. First of all, there are a certain (limited) number of types of content creators. There are the Hollywood-class 3D modellers — they’re all employed and have little time for playing around in VWs. There are the Hollywood-wannabe-class of 3D modellers: competent professionals who get routinely employed to do 3D logos or architecture movies to promote condos. Of those, perhaps half think that VWs are not “serious” enough, so, for fun, they create models which they sell in Renderosity or similar “pro” sites. The other half is all doing content for Second Life and IMVU. And then there are amateurs — people that have learned to use 3D tools for their own fun and have no intention to get a job out of it, but who naturally enjoy a few dollars if they manage to sell any of their content. These people are all in SL or OpenSim, since even on IMVU, being an amateur doesn’t pay off. One might expect that we’re talking about “hundreds of millions of users” that would fit in those categories. Actually, no. It’s more like hundreds of thousands. In truth, the fun issue of SL is that it actually enabled amateurs to produce — and sell! — content, at least during the explosive growth phase of SL. Once that phase went away, only the professional content developers who do not work for Hollywood (yet!) but have pretty much the same skills and talent are in SL… and they’re few. Very few. Many of them also develop content for IMVU. Many will very likely develop it for CP as well, assuming that they can get a new market that is worth the effort. Only a handful have started to develop for OpenSim, for instance, even though the time spent in converting content from SL to OpenSim takes a just a few minutes — because with 30,000 or so active users, the thousands of (mostly unconnected) OpenSim grids are still a tiny market. CP will need to grow a lot to start really capturing the attention of the pro developers. IMVU got the first few pros when it already had millions of users..
2) Facebook “integration” is being completely over-rated on the CP reviews. It’s totally pointless: the application runs on a Web page, yes, but it’s completely detached from Facebook. Currently you can only post pictures to your FB albums and/or invite friends from an easy interface. That’s the only real “advantage” (but you can do exactly the same within SL/OpenSim as well, it just requires an extra step) that mandatory FB logins give. People are not playing games on FB any longer; it’s getting out of fashion; Zynga is losing market value on its stocks, and all their games have always been perfectly integrated into FB, while CP is not. So “mandatory” FB logins are just great to avoid people logging in from scratch (LL should do that for http://join.secondlife.com/ as well — it’s incredibly easy to do so and would stop people from complaining that they have to type so many things to create an avatar) but it’s not “sitting on the doorstep of the biggest on-line user community in the world” like Inara Pey says. It’s just a convenient way of typing less things to create your own avatar — and making sure that everybody has a profile with a name (which cannot be changed) and a picture (which cannot be changed either). CP, right now, cannot “leverage” on FB ads. It doesn’t even integrate FB chat within its VW environment. It’s just a quick login solution. It might become one of many when CP launches. They might feature ads from Google, Facebook and Microsoft at some point, inside the virtual world, but… the point is that it’s not using Facebook like, say, Zynga does. I don’t know if this is a deliberate attempt at over-rating Cloud Party or not, but drop in to the landing zone and this meme is being repeated over and over again — perhaps it’s part of CP’s marketing policy, to try to give users a false sense of “immediate success”. 3) Web-based VW applications are only good for lazy people. 4) Look at the social aspect. That’s what will bring new users easily (even though they might leave afterwards). Kaneva is the best example of an attempt to catch people easily and tie them to a social environment first, and push them into a VW next. Sadly, Kaneva did “their own social networking tool” while Facebook was already on the rise, and so pretty much missed the point. Google Lively was launched without a close integration with Google Talk and it naturally failed; Lively 2, if Google ever thought of entering virtual worlds again, would probably be fully integrated into Google+ and be a much better success. The key aspect to get new users is to make sure that as soon as you log in to an environment, you can quickly find your friends, and invite new ones. SL suffers from “too much anonymity” — this means that most people, even if they wished, are unable to tell their Facebook/Twitter/LinkedIn/Yahoo/Google friends what they’re up to. IMVU is as bad as SL in that regard, even though it has its own social environment, just like Kaneva (aye, I know that SL technically also has my.secondlife.com, but it seems to be one of those eternal “work in progresses” that LL is so fond of starting but never finishing — why isn’t it fully integrated into the SL Marketplace, for example, or why doesn’t it allow sharing your timeline on Facebook, Google+ and Twitter?). This is where Cloud Party has some room to expand, as all their competition is shy about integrating with social networking. They can — if they’re willing; some already claim that this “beta” version is pretty much the pre-release, with only minor bugs to fix before the VW launches officially and CP starts leasing islands — grab this opportunity. Will that truly make a difference? Perhaps, to quickly attract new users. But the problem is converting them into paying customers. 5) Have a solid business model beyond venture capital. I must have written this a billion times, but it doesn’t hurt to repeat it again. Tech companies still live in the pre-dot-com era, and what is more surprising is that their venture capital funders still think this can work! Their assumption has remained the same one since 1997: give access for free, grow the number of users into the millions, and “somehow” it will work out fine. Well, let me give you an example. Suppose you’re looking at Facebook’s share prices on the stock market and wondering if it’s a good idea to invest in them, now that they’re low. Facebook is certainly going to stay around for another decade or so, and they are the largest online community ever, with (allegedly) 800+ million users and still growing — not as fast as before, of course, but growing. Surely they’re a solid investment, right? They also make about a billion US$ in advertising per quarter. That a bit more than a dollar per user. Not bad! Or is it? Depends how you compare it. There were 350 million Gmail accounts in January 2012. Google made US$42 billions in ads. So that’s around 120 dollars per user per year — thirty times more than what Facebook makes! Now do Facebook shares look so good? That’s why Apple shares are hot, Google shares are not too bad, and Facebook is a scam. When we try to apply this to virtual worlds, we have to analyse what each company is doing. Linden Lab is profitable. They have a million active users. These users transact half a billion US$ yearly. LL only gets a tiny slice of that on the LindeX, but because transactions happen mostly in-world, it means leasing land, and that’s where the bulk of LL’s revenue come from. And at the end of the year, LL gets 50 or 60 millions in profits after taxes. That’s not too bad. It’s not Facebook, nor Apple, nor Google. However, if the business model could grow indefinitely, and LL managed to get, say, 800 million active users, they would, from their tiny slice of the proceedings, get $20 billions in profits — half as much as Google but twenty times as much as Facebook. IMVU also has a very interesting business model. When they started, they put out some ads. Each time a user registered through an ad and paid something, they would take part of the money received and invest in further ads. They did it over and over again until the whole of the Internet was swamped with IMVU ads. But the strategy paid off: the more ads were seen “everywhere”, the more likely they would get a paying customer, and the more ads they could buy. This trend seemed to have stopped, but at least they have turned IMVU into a profitable company — mostly thanks to the ability of allowing content creators to make money as well, of course, and taking a commission from sales. Now, can you point me out what was Lively’s business model? Right. You can’t. How does Kaneva make money? I have no idea. The only guys that tried to replicate LL’s model so far were Blue Mars — and they nevertheless failed, since the price difference was not so big, and the amount of content and users was limited. Apparently Cloud Party is going the same route as Blue Mars and compete with Linden Lab on island tier and selling currency, too. The challenge is to grow the userbase — the paying userbase, which is the only one that counts! — and become profitable until their venture capital runs out. That might happen in 6, 12, 18, or 36 months — at best. That’s what they have, as a realistic time frame, to prove that they can beat Linden Lab at their own game — not in technical improvements or social features, not even in number of users, but in generating revenue using the same business model. 6) There aren’t that many people interested in social virtual worlds with user-generated content. In the Golden Days of SL where growth was exponential, the sky seemed to be the limited. Optimists like myself believed that “everybody would want to be in a 3D virtual world ” — it was a natural evolution from outdated, Web-based, 2D social environments. Guess what? We were all wrong. There are just a few millions that regularly enjoy social 3D virtual worlds with user-generated content. How many millions? Well, I’d say about… two. These are the regular users faithful to SL and IMVU. There aren’t more! On top of that, there are perhaps 20-30 million casual users, but they won’t become paying customers. If one stretches this to reach out to 2-1/2-D VWs like Habbo Hotel (who has failed in spite of everything), there might be, perhaps, 50 or so millions. But there simply aren’t more. It’s not a question of more marketing, easier interfaces, simple setup, or available content. It’s simply a question of mindset, and you can’t change mindsets easily. It takes generations. It’s thanks to the current batch of educators working on virtual worlds — numbering dozens of thousands, perhaps hundreds of thousands at best — that the next generation of users might be more familiar with 3D virtual worlds and eventually join them; but that won’t happen in the next decade. It might take a whole generation. In the mean time, Second Life, OpenSim, Unity3D-based VWs, Kaneva, IMVU, and whatever “survivors” are out there — as well as new start-ups like Cloud Party — will have to ferociously compete among a very small user base. Well, small, yes, but valuable. Half a billion US$ annually in digital content sales is not bad. It’s not as good as Facebook ads, or Skype minutes, or applications, or e-Books from Amazon.com, or music… but it’s not bad either. But there isn’t more: it’s all there is. What can Linden Lab do to survive? When IMVU became very successful thanks to their very easy to use Web-based marketplace, LL had to buy one and desperately try to compete there as well. They still have problems with the SL Marketplace. There is a big problem for LL if the SL Marketplace ever becomes “perfect” — if it starts seriously undermining in-world shops, it means that shop owners will drop their land, which means less revenue for LL. And they don’t recover that lost revenue from SL Marketplace sales. So SL Marketplace has to be “as good as IMVU’s” but not much better. When Blue Mars started to show a much better rendering engine with fantastic mesh support, and a different model of paying tier (one BM “island” could have 500 MBytes of mesh data, but it was up to the content developers to “fit” all the content they wished on that upper limit), LL started working on a better engine and a new viewer. Blue Mars collapsed before LL finished their mesh-based engine, and only now, with Land Impact, are starting to review how tier is connected to content. Lucky LL! Their competitors fail too easily 🙂 But then Blue Mars created an iPhone application and made LL wonder if that wouldn’t be a good idea to copy. We still have no clue if LL is doing a mobile SL version — even a “lite” version of SL — but there have been rumours around it. Blue Mars Lite might fail before LL releases their own mobile app, though, and, very likely, like many of LL’s projects, it will remain semi-abandoned for years. But is that enough? Hamlet Au, the eternal doomsayer, reports that Second Life might lose 10% of its landmass by the end of the year, based on a report by Tyche Shepherd (who is a RL statistician). This would mean that LL would barely make a profit in 2012, if at all, and their execs will be pressed to come up with solutions. Well, let’s try simple solutions. First of all, the meme that “Cloud Party will be an immediate success because it allows Facebook integration” has to be stopped. Quickly. But in a positive way: all Linden Lab has to do is to enable Facebook registrations, and do it quickly. That’s so easy to do and will take just a week of development time. If they wish to do it even better, they can simply subscribe to Janrain Engage, which will handle authentication and “integration” with a dozen different identity providers. With a few lines of extra code they can start sharing my.secondlife.com timelines on Twitter, Facebook and LinkedIn as well. And then they have to bring out a press release that they have completed “integration with a dozen major identity providers world-wide, including Facebook, Twitter, LinkedIn, Yahoo and Google”. That should cool down a lot of overhyping around the “importance” of being connected to all those social sites and identity providers. To understand how stupid this claim is — my own blog also allows people to “register” using half a dozen identity providers, including Facebook. That does not mean that I have “an expected audience of 800 million viewers”! Actually, over the years, as my readership has declined constantly, integration with so many identity providers has done absolutely nothing to improve my own site’s traffic! And so it will make no difference to Second Life, either — except for the media. Then they might be able to integrate some of the functionality that some third-party viewers have already provided, like the ability to post pictures directly to Flickr. Or even Facebook. Or even Twitter. Most of the code is already published somewhere else, and it wouldn’t be insanely complex to integrate it into the “main” viewers. Again, it requires very little development, and has a huge impact on the media. Development of a full-fledged Web-based/mobile viewer is something that either LL has been developing for long, or it will simply take too long to make an impact in the short term. It’s also only hype — the amount of people actually using a Web-based viewer for SL will be small. LL, in the past, were obsessed with the concept that Web-based/mobile viewers needed to convey “the full range of SL experience”. That’s pointless to aim for: go for something simple that works, which shall please the media, see the reactions, and only then work with something that is “perfect”, which might actually never be. In the mean time, the few thousands that might be in desperate need of a Web-based or mobile viewer will be happy and write articles about it. Of course it’s impossible to figure out the millions of features that SL needs and fix the trillions of bugs that SL needs to have corrected. But, in truth, they don’t affect residents that much. What affects everybody is… tier. Even if it’s just indirectly: a free account might not worry about tier, but they will worry that their favourite spot, which is being paid by someone else out of their pockets, disappears because the owner cannot afford to pay any longer. Well, the good news is that this requires little development, but merely a policy change. And here I have to borrow the idea from my good friend Scarp Godenot — move to a model based on sales tax on L$ sales. Before you all start to collapse on your chair and yell “NO!! !” consider the following: LL already does that on the SL Marketplace, and people are fine in selling there. Why? Because they don’t need to pay tier on the SL Marketplace. The more content creators are on the SL Marketplace, the less they pay tier — since they can close their in-world shops and move to the Web instead — but that means LL is going to lose even more money. Trying to “replace” in-world sales with SL Marketplace sales is not a good strategy, long-term. Now imagine the following scenario. Suppose that someone rents a whole sim for US$295 for their super-mall. Currently, they pay zero taxes on sales. So what that means is that as soon as a content creator makes more than US$295 monthly, they have covered the costs of tier, and everything else is profit (well, minus labour costs in creating the content first, as well as, ads, and so forth — but you know what I mean!). For some content creators, reaching that amount of sales is easy. But for most it’s not. So here goes an alternative model. Instead of paying for the full tier, you pay a sales tax on every item sold on your region. The more you sell, the less tier you pay to LL, who will deduct the amount of sales tax from the region tier cost. So if you don’t sell anything, you will pay LL the full cost of the region; if you sell a lot, you might be able not to pay LL anything at all. If you sell so much that you have paid everything to LL for that month and you’re still selling more and more, then LL is getting a lot of taxes just from you. If that annoys you, you have a good choice: get a second region. Perhaps it’s best to give an example. Let’s suppose that the sales tax is 10%. If you do zero sales on your region, you pay for the whole region — US$295. If in one month you sell the equivalent of US$10, then LL applies a sales tax of US$1, and your region is just charged US$294. But if you’re one of the top content creators and make sales equivalent to US$2950, your region is free of charge — all the money collected in taxes have been used to pay for your region. If you sell US$6000 in a month, then you get your region for free, but LL also gets an extra US$305 on taxes, beyond the US$295 they have received and which went to “pay” for your region. Now this doesn’t automatically mean that LL is going to earn gazillions from taxes. What it means is that a clever region owner will try very hard to pay as little for their regions as they can, by adding as many regions as they can, as their income from those regions increases. The result? Successful business owners will start adding landmass again, just to be able to cut down on tier costs. Think of it as a “tax return on investment”: the more you invest in landmass, the less total taxes you pay. Notice that this model has two advantages. LL is not going to lose money just because they “give” you a region for free, if you happen to be very successful in generating sales — they collect taxes, after all. People not doing any sales will not be hurt — they won’t pay anything additional, but the cost of their own non-profit sims won’t be raised. They will remain at the same price. Land barons won’t cry havoc because of a sudden reduction in prices. Instead, they know that the more rent they collect on their own regions, the less they will pay for them. The same will apply for mainland region ownership as well, of course; and possibly it might be even feasible to create a model for private regions with individual parcels to apply a two-step tier collection process, where sales from individual parcel owners contribute “tax” to the region owner, who in turn will get a cheaper region — and a free land market will make region owners pass the reduced amount on their clients. Things get trickier with group ownership, and items distributing money among several people, but I’m sure the clever people at Linden Lab can design a model to deal with those cases. But that’s not all that LL can do. They can also work on the side of dramatically reducing costs, and by doing so, offer new kinds of regions for a much lower price. I call them “blink regions”, but they’re really pretty much the kind of service that Kitely already provides, just done with LL’s own infrastructure and integrated into a visually contiguous virtual world. Take a look at the SL map. How many regions have green dots on them? As we all know, green dots accumulate on popular spots, but the rest of the grid is mostly empty. Now this is rather stupid from the perspective of LL, because so much CPU power and memory is being spread over the grid, useless for all purposes, because nobody is there to use it. Since LL needs to have the simulator software running all the time, they have to charge them in full — even if nobody is visiting them. Kitely correctly identified this issue, and does something clever on their OpenSim “grid”. Every time someone logs in to a region, it pushes an image of that region to an Amazon server hosted on their cloud, and launches it. This takes very little time. Once the region is up, it works pretty much like a normal region, and users are charged for the time someone is online. When you log off the region, and nobody is there any longer, the region is saved to disk and removed from Amazon’s cloud — and you don’t need to be charged any more. This is all done automatically and is great for “temporary” setups which will be just used a few hours per day or so. There is really no reason for LL not to implement something very similar, with the only difference that there is visual contiguity on the grid. When you open the map, it looks just like before — but actually the only simulators running regions are the ones with green dots. Empty sims are unloaded from the servers. As soon as someone teleports to a “blink region”, its image gets loaded by one available server, and instantly restored — the resident will not notice a big delay, since they will be watching the teleport screen anyway. If a lot of people pop in, and a sim is full all the time, well, then it will be using CPU and memory around the clock, and LL will charge the region owner the full price. But if someone buys a whole region and just uses it one hour per day, then the region will be charged at merely US$12/month. Think of that! Having a full region of your own, with all the 15,000 prims, with all the quality that LL guarantees on their grid, for less than most OpenSim operators charge. Sure, you will only be able to use it one hour per day (to keep the costs low) but that might be enough in most cases. Even if you use your region several hours per day with your friends, it might still be much cheaper than anything else out there. And from LL’s perspective, they’re just saving resources, or rather, using them more efficiently. In practice this requires some more development: effectively this pretty much means running the whole grid as a cloud service, which is something I never understood why LL hasn’t been doing for years — as there are lots and lots of open source and free cloud management systems out there. LL might very likely be able to run the 30,000 or so regions they have on just 50 or 60 servers, instead of the 4 or 5 thousand they allegedly have (probably less these days, as they’re running more and more sims per server, thanks to an increase in core density). This is because cloud technology also uses virtual servers, which can get allocated more or less CPU and memory depending on usage, and we know that LL already runs their simulator software on virtual servers anyway — all they need is a cloud supervisor software to dispatch simulator images to free CPUs across the grid. And under such a model they could follow Kitely’s example and just rely on Amazon’s cloud service instead, and just keep the handful of central asset servers on their co-location facility. The costs savings would be tremendous, even though I still believe that the biggest cost that LL has is with their staff, so this option would really need to be carefully evaluated in financial terms. But the end result would be the ability to cut costs dramatically for everybody that doesn’t really need “always up” regions but just “blink regions on demand”. Obviously large malls or event areas which are in use 24h/day will not see a tier reduction that way — but there is nothing to stop LL to adopt both strategies: sales tax with tier refunds plus a cloud-based grid. So the more you sell, the more likely your region is always up, but the more likely your sales will pay for tier costs. Smaller shops with little traffic will raise little sales — and thus little taxes will be gathered — but since they will only cost a fraction of a total sim (because they will be little used), this might be enough to get even small shop owners their land “for free”. Of course there is a catch: ‘bots. ‘Bots roam the grid in search of vital statistics, and by doing so, they will automatically instantiate a region, which will get charged by the time that the ‘bot is active. Since you cannot prevent ‘bots from teleporting to your place — since ‘bots are only voluntarily labeled as such — there is a problem here. Even if SL — like OpenSim — provided a lot of statistics via web services, thus rendering most ‘bots obsolete (and one wonders why LL has been so reluctant in opening up more sim statistics via web services…), there will always be “legacy” bot sytems roaming the grid, as well as griefers and abusers. So I can imagine that this model would require some thought. Perhaps LL could just start offering “blink regions” as an optional service, at a lower cost, while still keeping the remaining services just as they are. They also might offer the service in “chunks” — say, owners could preset their regions to be on at most 72 hours per month (1/10th of the time) and commit to pay a tenth of the price. This would give them two and a half hours per day or so. But if a griefer starts adding ‘bots to force the region to be “always on”, the owner would just get 3 days of service, and then the region would be placed offline. Before that happens, the owner would get a notice, and could look into things to see what happened — and notify LL about the abuse before the time runs out. I know this is a complex situation (they might demand refunds and so forth) because LL is so reluctant to deal with abuse reports (as so many are fake) — it would mean that LL would really have to develop better tools to track down who had visited the region and for how long, which would be part of the Estate Tools, so that both LL and the region owner could track down potential abusers. As said, OpenSim includes all those statistics and makes them available through easy-to-understand web services in multiple formats. LL’s technology is quite different but I’m sure they have a way to get the same data as well. A variation to prevent abuse would be to limit usage to non-paying customers, finally giving Premium users some real benefit. Imagine that non-paying accounts would be limited to be in-world, say, one hour per day (or perhaps a total of 30 hours per month). That way, a griefer ‘bot could not do much damage on its own, and LL has ways to figure out if someone is launching a lot of ‘bots from the same network and prevent that from happening; for example, they could restrict one non-paying account per unique IP address/CPU. This would not prevent distributed denial of service attacks, where hordes of abusers coordinate their attacks from multiple locations, but it would go a long way to prevent the simplest attacks and make the others harder (there are not so many large groups of griefers coordinated together any more; they have lost interest in SL). Premium users, by contrast, would get unlimited access to SL. But those who abuse the system by forcing other people’s regions to be up all the time are easily charged — LL has their credit data online. Abusers could be blacklisted or even sued, since LL knows who they are. Giving Premium users some real benefit — the ability to be around all the time! — is also a good idea. Let’s be honest: Premium is cheap — US$6 per month if you pay it annually, and you get L$1200 free to spend every month on top of that, so it’s really a bargain. There is little reason why a regular user shouldn’t pay a few dollars per month just to be able to remain around much longer than the non-paying users. To summarise, what I welcome most with Cloud Party is how it will push Linden Lab in reflecting a bit about their options and come up with ways to compete better with a worthy competitor. At this stage, Cloud Party is just a “SL killer application” for a handful of content creators (aye, I know there can easily be a few thousands of those around). Cloud Party is not SL, but it’s close, and a lot of meshed content can be exported with some ease into CP. It might be easier to setup and use than competing technologies like Jibe and the many other web-based virtual worlds launched by SL exiles, all of them looking better than SL in certain aspects, but quickly forgotten by the media as they are drawn into oblivion — except by their owners, who sell their solutions directly to customers (mostly educators and corporations looking for simulation and training environments in 3D) which might not even have heard about SL. SL die-hard exiles are happy on OpenSim, because it’s a much “closer” clone, even though the reliance upon a SL-inspired viewer means that there are no technological breakthroughs on the visual side, which Cloud Party might be offering now. Cloud Party also might be drawing some IMVU users, because the IMVU content creators will have easy ways to port their content to CP, and CP offers easy building facilities, not unlike SL, which IMVU currently lacks. Nevertheless, this is an old story — every other year or so (albeit less in recent times!) some start-up creates “the next SL killer app” by targeting content creators and programmers, because that was how SL was launched in the first place, by appealing to them with a modern renderer with lots of features and high visual impact. But these companies all shut down quickly after burning all venture capital because they haven’t found a valid business model to become sustainable long-term. The big issue will not be if Cloud Party offers more and better features than SL. Some are already much better and not easily duplicated by LL in the short term. But in the past, a lot of start-ups have developed better virtual worlds than SL. Many of those allowed user-generated content. These days, I don’t even remember their names, and need to browse through old articles and YouTube videos to remember how cool they looked like. The current batch of virtual worlds that are still around all have companies with valid business models behind them. Except for IMVU — which has a larger user base than SL — the majority of them have a tiny amount of actual users, but they have companies behind them with sales forces which push their solutions to educators and corporations, and are more “development platforms” than independent virtual worlds for average users. I really have no idea how most of the generic, mainstream virtual worlds (like Kaneva) are still able to be around and afford paying for all costs — the few that survive are oddities. So to be able to predict Cloud Party’s success we will need to understand how their business model is presented and how the company will promote its product, and what their target is going to be. Right now, it’s a tempting beta application, gathering as much attention as Blue Mars did when Blue Mars was in beta, too. The real test will come when it gets officially launched and has to struggle to survive in a very small market. Because even the OpenSimulator grid operators have learned a tough lesson: it’s very easy to launch a virtual world (specially if the software costs are zero!) and announce prices to undercut Linden Lab. But as soon as a grid starts attracting people, the costs will skyrocket very quickly. The largest OpenSimulator grids are charging prices closer and closer to LL’s own, but offer a worse service — for residents disgruntled with LL, it’s the only option, but there aren’t that many as one might have imagined from the forum discussions and blog posts. A new technology with new features which radically departs from LL’s technological platform might be very welcome, but one also has to wonder how well it will scale. For example, when a Cloud Party island reaches the 25-avatar-limit, it gets sharded — a clever way to allow many more people to see the same content! — but obviously that means that the next 25 avatars will not see the first 25. They will be on separate islands. If you’re planning to do a mega-event with 400 avatars on the same location, you won’t be looking for Cloud Party to host it. 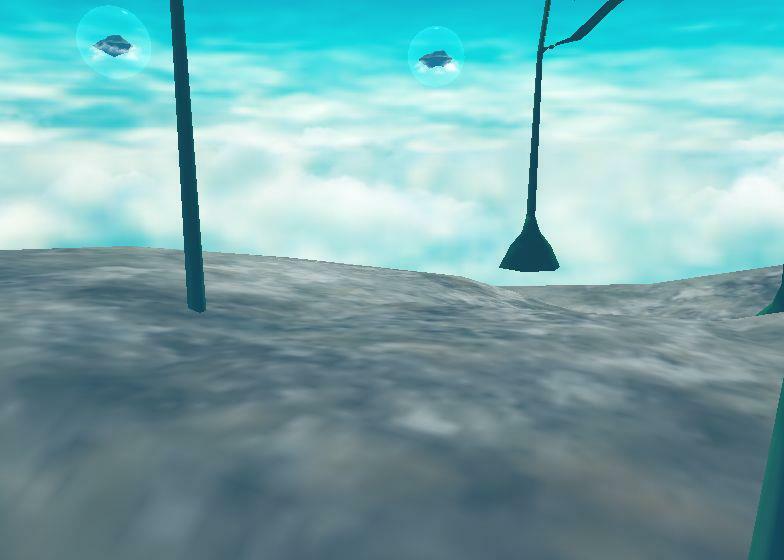 Second Life might just barely manage it, assuming you’re willing to fight the lag. Intel has developed a technology called Distributed Scene Graphs to allow “hundreds of avatars” on a modified OpenSimulator version (it’s currently publicly available on Dreamland Metaverse) which is perhaps the only way to get huge regions with lots of content and lots of avatars share the same experience — but it’s not (yet) in widespread use as it’s still in the alpha development stage, although it sounds promising. To conclude, it’s not that easy to compete with Linden Lab’s Second Life as most people would like to believe. What has Cloud Party and that makes it so special that Blue Mars, Project Wonderland, etc. and all the “missing” virtual worlds had not? I agree that CP’s biggest hang nail is the revenue model – and that it is far too early to judge whether the company will sink or swim based on what we’re seeing. There have been sweeping statements made that CP “spells the end” for SL or that CP “and doomed to fail”. Both sets of statements are valueless simply because we don’t know. Period. And until we do start to see a roadmap and can see the direction being taken and what lies on the horizon, that’s the way it will stay. But… as for the “FB integration” being valueless – I’m not so sure. But again, that comes down to how the company intends to build the product and present it to a wider community of possible users. I challenge LL to add FB integration on the Join page (which is, after all, what CP does!) and see if it makes any real difference. They could do it in a week. Probably less. It’s really childishly simple. Ahh yes, it’s often childishly simple if you’re not the one doing it. Ahh, it’s often “childishly simple” unless you’re the one doing it, and have to deal with years of accumulated technical debt. I don’t have an answer, but SL is not a website, it’s a 9 year old multi-tier application. I remember at one point there being a push to integrate SL with FB, which resulted in much gnashing of teeth from residents. The vast majority willing to speak on the matter hated the idea and valued their anonymity. The feeling was that SL was not part of RL, whereas FB was a virtual representation of RL. That all made sense to me, which is one reason why I don’t see SL ever growing (in the most ideal world) beyond 10 million worldwide. It’s just not part of RL, it’s more equivalent to an MMO from that perspective. Doesn’t mean it can’t be an ongoing concern and nicely profitable – though that’s not what VCs look for in a company. As for your revenue idea, I’ll keep it short: That is the correct answer. Good blog but a little unfair to Intel. They had at least two public tests of DSG on ScienceSim within the past two years, both of which I attended. We were told they were using Amazon servers and the number of avatars (mainly scripted bots) was in line with public pronouncements. Lag varied a lot (they were tuning the system) but on the first occasion I was seriously impressed. Second time round I crashed and had to leave early anyway. DSG is available on request from Dreamland Metaverse though I don’t know anyone that’s used it nor whether an additional charge is made. I think that I wasn’t quite clear 🙂 There was much talk about real integration, e.g. like seeing people’s friends inside the viewer, clicking on Likes on in-world objects, or more complex integration like I have discussed last year. That’s complex. That’s months of development, even though it might not seem to be so hard. Of course, if they just added an extra field on the database registering the Facebook account, more could be added later… but wait! They do! This information already shows up on my.secondlife.com! So what are they waiting for??? My apologies to Intel. I really wasn’t aware that Distributed Scene Graph (DSG) had been publicly released by Intel or even actually being used by some OpenSim operators. I’ve updated the article to reflect your comment and added a few extra links to the DSG white papers and to Dreamland Metaverse who provide that service on their servers. Thanks for pointing this mistake out! How long have people in Second Life been complaining about group limits and group chat? How many time has the backend infrastructure for groups been changed? How long did it take for ‘web profiles’ to become a thing, and how successful is that right now? Who’s using web profiles more than Plurk? And is it possible to share photos in web profiles? How long has identity/names in Second Life been an issue? Predefined last names or ‘Resident’? Seems like it took one year to get display names out the door, half a year to decide it was a mistake that can’t be fixed. I bring up all the above because the social layer of Second Life isn’t trivial. It’s been one of the most complained about, evolving and everchanging parts of Second Life. Development time for it hasn’t been free. That said, Linden Lab was and still is right to want to control their own authentication, their own groups, their own direct messaging, their own plethora of different chat systems, their own outsourced voice solution, etc. Rod correctly understands Second Life is a social network of its own. Cloud Party devs are ducking having to do all the above work. Facebook offers them more than just authentication. It avoids a team of 5 the headaches a team of 200-300 at Linden Lab still haven’t completely overcome. The Cloud Party devs though don’t understand that most Second Lifers will happily do without a timeline to share screenshots in exchange for being able to log in pseudonymously. We’d live with a trivial IMing system, bare minimum profiles (most prefer V1 style profiles anyway), etc. 3) Web-based VW applications are only good for lazy people. & 4) Look at the social aspect. Depends. Cloud Party vs. Second Life isn’t Google Docs vs. Microsoft Word, but it also isn’t something like trying to fit Crysis into WebGL vs. Crysis natively. Cloud Party for me runs a lot better than Second Life right now with comparable amount of user-created geometry, textures and etc. on screen. -Much- better. Also worth noting that browsers themselves are ‘native’. Each tab runs in its own process so the overhead of having YouTube in a tab has as much effect on Cloud Party as it does Second Life. And WebGL is just a feature parity of OpenGL ES 2. It directly accesses your GPU and benefits from it the same way Second Life does in the ways that matter. I’d say its also a plus, not a negative, to have outsourced the promotion, distribution, development and continued updates of part of one’s client to Mozilla and Google. So yeah, IE will never have WebGL, Safari and Opera may take awhile more to turn it on by default, but Chrome and Firefox themselves is an install base that dwarfs anything a standalone application can hope to have. 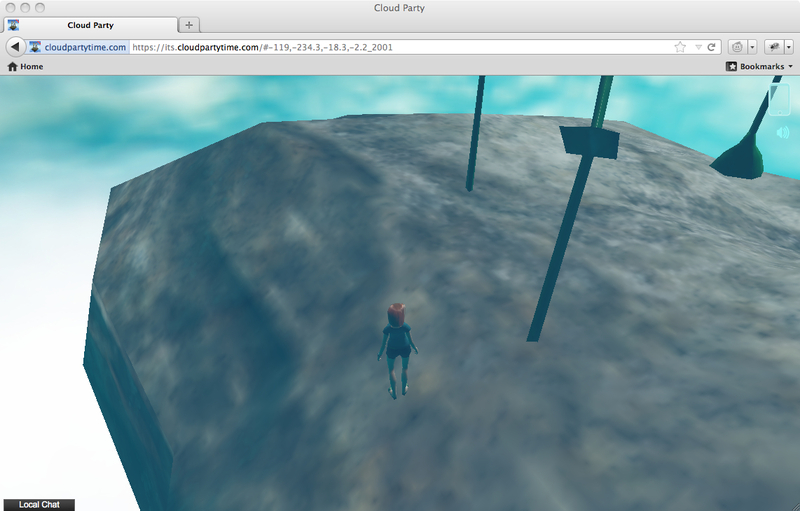 The most, most important thing I see people missing about Cloud Party being in the browser though has nothing to do with avoiding a download or leveraging WebGL, it’s the fact that every place you stand in world has a URL to it. That’s a URL to the windmill section of the mini-golf course island. The important part of that URL is after the hash #. Four comma-separated values, the first three are X, Y, Z coordinates, and the last (1_2012) seems to constitute the private island number and which instance of it. To me, that’s HUGE. Combined with that, the ‘anonymous login’ isn’t just a temporary compromise for those that don’t want to use Facebook, its a bit of the whole point of Cloud Party. Zero barrier invitation. Anything I build, I can set someone right ontop of with 1 click provided they have Chrome or Firefox. And that URL bar changes a second or two after you stop moving everytime you do. It’s obviously meant to be an important part of Cloud Party, and probably the main reason it isn’t a Facebook app anymore and can’t be in the future. But why can’t Second Life grow? Because the people don’t come, or the Second Life viewer is too usable to keep them and tier prices are crushing the long-term users? 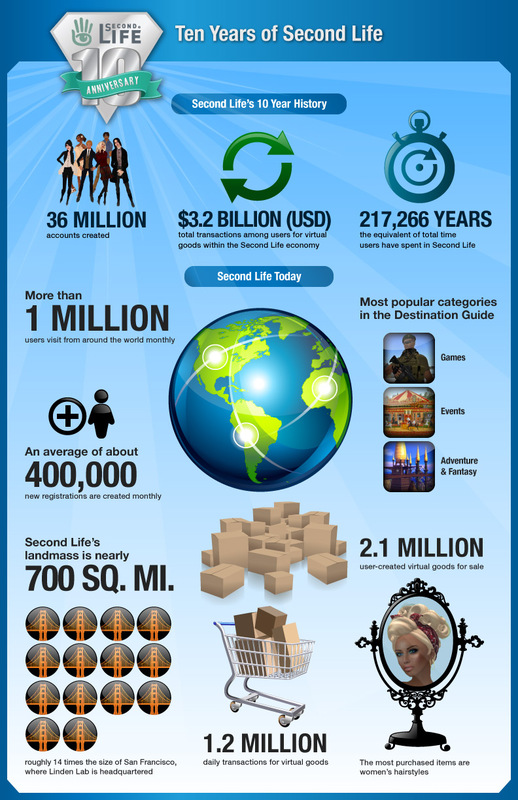 Never forget that Second Life gets 10-20k sign-ups a day. Maybe 19k a day mistake Second Life as something its not; like a free to play MMO, but heck even if only 100 of that 10-20k properly understood what they were getting into but were underwhelmed/turned off, that’s a problem with Second Life, not with the attraction of virtual worlds. That aside; Cloud Party will sell virtual islands. They’re being prepared for sell right now. Their revenue model isn’t a mystery. The details are there on Hamlet’s blog. Not sure why you’re responding as if you found out about this company on TechCrunch. We found out about it on Hamlet’s blog. Their CEO is logged in-world everyday, he isn’t on jets doing tech demos for VCs, he’s answering questions for his actual prospective customers. Everything about Cloud Party, inclusive of staying as small as possible as right now screams bootstrapping. Give them credit for that. Or don’t, but they deserve it. I refer to my earlier point that just because Second Life is unable to convert on 10-20k sign-ups a day doesn’t mean another company would. Ontop of that, in a market where virtual good sales is ruled by buying ‘Energy’ from Zynga, I’d say it’s worth prodding it to see if there’s interest for virtual goods beyond it. Second Life already proves it. In the tune of 10-20 million USD in user to user transactions a month even while converting a grand 1% or less of new registrations into noticeable concurrent count rises. There you go, you make my point well 🙂 It’s content creators — hobbyists or professionals — that will be most inspired by Cloud Party and every other VW out there which has so many more features than SL’s viewer is able to render. I guess that the jump from a content-creator-only world to a more mainstream one came as a big surprise to LL as well… in 2004 at the latest. Before mid-2004, everybody in SL (there were just 5,000 people around back then) seemed to be a content creator of some sort anyway. How long have people in Second Life been complaining about group limits and group chat? I don’t know. “Always”? It certainly was already the case in mid-2004 when I first logged in, and it was definitely one of the topics back then. How many time has the backend infrastructure for groups been changed? This is something we don’t know for sure. A couple of times, certainly, in the past eight years or so. It’s possible it has been changed more often but who knows? How long has identity/names in Second Life been an issue? That’s easy: at least 8 years! 🙂 Like groups, chat, etc. it has always been an issue. Predefined last names or ‘Resident’? Seems like it took one year to get display names out the door, half a year to decide it was a mistake that can’t be fixed. I bring up all the above because the social layer of Second Life isn’t trivial. It’s been one of the most complained about, evolving and everchanging parts of Second Life. Development time for it hasn’t been free.That said, Linden Lab was and still is right to want to control their own authentication, their own groups, their own direct messaging, their own plethora of different chat systems, their own outsourced voice solution, etc. Rod correctly understands Second Life is a social network of its own. Now, I’m not so sure about that, but then again, I haven’t been following Cloud Party’s devs at all, so I have no idea what they’re planning to do. What the beta version shows is… pretty much nothing at all. Just like the Blue Mars beta, which lacked whatever social networking tools whatsoever. In fact, if I remember correctly, the only VWs who has something resembling groups, private chat, and so forth, are IMVU, Kaneva, Moove and the like… which all do it on Web pages and not “inside” the virtual world. The concept of having an in-world group with some features on its own — popular on MMORPGs — somehow failed to be implemented in most “beta trials” of social VWs I’ve participated, which seems peculiar: aren’t they supposed to be social virtual worlds? I think, however, that even Cloud Party will not tie into Facebook Groups directly (i.e. provide a front-end to Facebook Groups or Facebook Chat), because the user interface doesn’t seem to be designed that way at all. They’re just using Facebook logins to establish usernames, initial profiles and profile pictures. Keeping it minimal — just for basic registration — will allow them to use other forms of authentication as well (e.g. Twitter, Google, Yahoo), but requires CP to implement their own group/chat tools. Right now there is just island-wide chat and private messaging… if that changed before the beta version becomes an official launch remains to be seen. Most people report the same — I seem to be the sole exception — so I’m sure it’s just a question on how old one’s hardware is (and thus not fully supported by WebGL). My point is that WebGL cannot compete with a native application running OpenGL — or DirectX. But your point is also true: who cares, so long as the only competitor is Second Life, and it runs faster than Second Life anyway? The problem with estimating performance on a beta version is that it’s hard to predict what will happen when a lot of extra functionality is squeezed into the WebGL application in a few years. Here is a typical example: when SL avatars started to have a few scripted attachments — a 4-prim gun and nothing else besides textured clothes — all was running well. A few years afterwards, with hundreds of thousands of polygons with twisted-prim hair, each strand scripted to respond to size commands, everything started to fall apart in terms of raw performance. This would completely have been missed during a beta evaluation of SL, where, at the beginning, everybody just had basic, textured avatars. Nevertheless, LL had to deal with all those problems that came up much later in its history, as users started creating content in completely unforeseen ways (which have never been tested before). Cycling sculptie textures 15 times per second to give the illusion of organic body movement on scripted animals? That’s totally insane! But that’s exactly the kind of craziness that happens in SL all the time, and, taking into account that most residents are not concerned about the overall impact they have on the surrounding performance (unlike game designers when creating a new game), it’s hard to deal with that. Now one might assume that the Cloud Party developers can gain from a decade of experience in dealing with insane user-generated content, and know in advance what users are going to do. For instance, doing everything as meshes (namely, clothes and accessories!) avoids trillions of polygons added to avatars (even though the current implementation makes mixing and matching clothing a bit hard). Maybe ‘bots are standard from the very beginning, and as CP allows any kind of skeleton to be used for an avatar and allow it to be animated, well, perhaps they can avoid the many tricks and exploitable loopholes that SL developers needed to go through to create the content they wanted to… but I have no idea, really.Consider vehicles, for instance. I haven’t read the programming documentation for vehicles in CP. Are they natively supported? If not, it will mean that eager developers will try to simulate vehicles using insanely complex scripts. LL was lucky in that regard because the very same Cory had created a vehicle interface to the already-existing Havok libraries. OpenSim, by contrast, has such a hard time implementing vehicles that are as easily scripted as SL vehicles because ODE lacks the kind of support for vehicles that Havok does. Putting into other words: it’s really hard to know if CP is able to keep up its amazing performance once content creators start hitting all sorts of limitations and, attempting to subvert them, introduce heavy performance hits everywhere. As said, the only advantage that the CP developers have is that they can see what content creators are doing in SL and make sure they cover all possible cases without sacrificing performance. At this stage it’s hard to say if they did, indeed, cover everything. Well, with that I completely agree! That’s also a reason why some have proposed that LL just dropped their own viewer and renderer and bought a license of Unity3D instead. All they need to do is to integrate Unity3D into their backend servers. Imagine how much money LL would save — pushing all renderer development costs to Unity3D! And Unity3D, of course, already runs on pretty much every platform out there, (Web, mobile, and game consoles included), is a robust engine, and has a good community support. So why does LL insist in sticking to their renderer instead? It’s called market stagnation. There aren’t more people interested in virtual worlds 🙂 Note that this is my own theory; I have no factual data except for years of tracking down this trend. It’s true, and it’s rather hard to understand why so many people register for Second Life but so few — only a handful — actually remain. As said, my own theory is that people are not interested in social, user-content-generated, 3D virtual worlds at all. If SL gets 10-20k sign-ons every day, so does IMVU, but they don’t grow exponentially thanks to that (and they have no barriers of entry, since you can register to IMVU with Facebook [3 million Likes on Facebook! ], Yahoo, Live ID, Twitter, Orkut, MySpace…).I wonder if it’s the “download this application now” that puts people off. The truth is that we don’t know. My point is that there is an upper limit on people interested in social virtual worlds, and we have hit that limit long ago. So, yes, I believe it’s the “attraction of virtual worlds” that is at stake, not necessarily “Second Life” in itself. That Linden Lab is not that company, it’s quite clear to all of us! Now that’s a point where I totally agree with you. The market might be “small”, but what is “small”? In SL, it means half a billion US$ annually. Sure, Web-based ads provide hundred times that revenue (world-wide), but, well, half a billion US$ is half a billion US$, and it’s not a value to be neglected! So, yes, there is a market for virtual goods. We know that. Anyone claiming otherwise has been sleeping for the past few years. The question here is if this market requires pulling users out of SL and IMVU or if it can grow beyond that. I still stick to my theory: it does, indeed, require pulling people out of their current virtual worlds. Cloud Party has a few advantages over both SL and IMVU to be able to get a share of the attention, specially because SL and IMVU are based on technology that will not evolve to compete easily with CP. SL, of course, due to LL’s stubbornness; they could do it, they just won’t do it, because no matter who is at LL’s helm, they are placed inside a mandatory deep well and shut out from their users’ complaints and from whatever else is happening in the world. 🙂 IMVU might really not have a sufficiently flexible technology platform to allow things that are so easily accomplished in Cloud Party. Well, for all it’s worth, I think that Cloud Party, being launched right now has a slight edge on previous “SL killers”. All of them in the past had to compete with a growing SL userbase. This is the first period in LL’s history when the userbase is slightly shrinking, and the landmass also being reduced systematically (it’s not just a monthly trend, but a slow reduction every month), even though the economy is still steady and growing (very little, just a bit; the problem is that LL doesn’t benefit directly from the growth of the SL economy). What this means is that Cloud Party has the opportunity to figure out why people are leaving SL: it’s because of tier? Tiredness with SL’s many limitations? With LL’s policies? Or because the interest in VWs in general has faded? In the first three cases, CP will be able to grab a fair share of LL’s current customers. The last case is really problematic, but I don’t think it’s true on a global scale, just on an individual case-by-case basis which, however, doesn’t affect the overall VW population (but, again, I might be wrong on that as well!). The hope of course is that competition expands the category of virtual worlds more than it lead to cannibalism, but you’re right we’ll have to wait and see. I agree with all your points, and in a few days or so we should know what Cloud Party island prices are. That’ll go a long way in determining how much of an alternative it can be to Second Life. I totally agree. If they’re going to be close to what the cheapest OpenSim grid operators are charging, I wouldn’t like to be in their shoes — Cloud Party might well become an “OpenSim killer application” first, instead of an outright “SL killer application” — but that would just be what comes next. I’ve heard that CP have “a thousand registered users” already. That’s not bad, considering that the only “advertising” for the beta trial was Hamlet’s original article. If all of them start creating content and putting it on sale, they might reach 30,000 users by the end of a month — and that would be the amount of total active user in all OpenSim grids, and five or six times what LL had in SL back in 2004. It might not look like much, but… it would certainly start paying back some real money to Cloud Party and encourage them to pursue it further. What are they waiting for? As I said, there was so much pushback on the idea of FB integration we (now they) put all of it on the back burner in order to finish other stuff. And actually, I would question whether having a button which goes to Facebook, pulls a personal data and populates a Linden page with it, provides a meaningful improvement for any real segment of the population. You question well if the improvement is meaningful. I would argue that it’s not meaningful at all — except for the media. An announcement that “If you have a Facebook account, you can now join Second Life with a single button click — 800 million users can now easily get their avatars in the largest virtual world with user-generated content” will go a long way. It might attract just a handful of those people who are really too lazy to type two words, a password and an email address. But as we all know, that’s precisely the wrong type of people needed in Second Life: engagement and commitment are necessary! So in terms of being meaningful — you’re right: it is totally pointless. But in terms of positive media impact it’s huge. Great article and some interesting comments too. The tax idea is something that has been on my mind for a while. If we see SL as a country and LL as a government, then it’s not unreasonable to see them levying a sales tax in return for services. It could go a long way towards them getting the revenue stream that they need. On the subject of Facebook though, I’m less convinced. Facebook have made it quite clear that they will delete the FB account of anyone not providing true RL information, which immediately precludes all ‘lat’ behaviour such as having a Facebook page for your SL avatar. So I find SL and FB being uneasy bedfellows in that respect because, for me at least, I see my SL as being separated from my RL. In SL I can re-roll the dice a different way than how they were cast for me in RL, and as such I don’t want ever-increasing connectivity between RL and SL. On the subject of Facebook, perhaps I haven’t been very clear 🙂 I have the experience of registering to an online game using Facebook and getting my account deleted because I’m not “real” enough for Zuckerberg — and thus being unable to log in the online game (who has no qualms about my “identity” — they just offered Facebook registration to make things easier). So obviously a strong tie between FB and SL is a very bad thing (or a strong tie to any other identity provider, to be honest). No, my idea was just an attempt to try to deal with people’s increasingly shorter attention spans. Today I had a chat with one of my teachers, who noticed that a decade ago people would be willing to wait a minute for a web page to load, but these days, if it takes longer than a second, they just give up. Short attention spans are a plague — teachers complain all the time about their students because of that! — but the current society and culture encourage shorter and shorter attention spans all the time, so instead of complaining, one should just go along with it and adapt. The idea is just to get people to register faster to SL — as an option. Once you have an avatar name and a password, you’ll have to use the viewer anyway. At that point, FB becomes irrelevant, as people with ultra-short attention spans will not use SL long enough anyway 🙂 But at least one barrier of entry is lifted: registration can be swift and just a button away. As I’ve repeated already, there is also the media effect: announcing “registration through Facebook for SL” means that the ignorant journalists will repeat the meme that “now SL is open to 800+ million users”, as they did for Cloud Party, even though that claim is ridiculous. But it’s also irrelevant if the claim is stupid or not: what matters is that journalists will write about it, and people will repeat it. Once they’re logged in, it’s irrelevant if SL is “integrated” with FB or not — it only matters that people will think it is, and that’s all. protecting IP? no system.. plus thousands of models to be ripped from renderosity / poser etc. Since you asked how Kaneva makes money (I used to work there) they don’t. Never have. It’s Chris Klaus’ little ego project, and it’s always been financed almost entirely out of his pocket. Which is much easier to do since they massively downsized in 2008. (I haven’t logged into the 3D world since the downsizing, but the main web page doesn’t seem to have changed a pixel since). Seriously, when I was there before the downsizing the company was approaching 100 employees, yet we’d have company status meetings where everyone would cheer if we sold $1500 worth of digital merchandise over a weekend sale. Surreal. Gosh I had no idea, really! No wonder I was always baffled about Kaneva’s business model. It seems strange how they have survived for so long if there was no apparent way of the company to make enough money during all those years, and it would be very optimistic to believe that they continue to raise money from prospective funders just to keep it going until they break even… selling whatever they are supposed to be selling. Surreal is the right word! Thanks for the clarification, though. It was an eye-opener! First: thanks for this post. I had not looked at Cloud Party till I read it and now I have. It is pretty impressive in terms of how fast and easy to use it is. Second: a quick thought about potential performance issues. Looking at it, one of my first reactions was that they had chosen their metaphors carefully. In SL the metaphor is one big landmass, with additional islands off its coast. One result of this, which I am sure we have all seen, is that the land you rent may be affected by the appalling scripts running on your neighbour’s land. This also has an impact on rezzing. Cloud Party, on the other hand, seems to have a metaphor that places you in the middle of a swarm of comets or mini-planets. You can teleport to any planet that you can see in the sky but the land on that planet is NOT contiguous with the land where you are currently standing. This makes a big difference in terms of scalability because Cloud Party will, in effect, be running lots of one-sim worlds which users can move between. 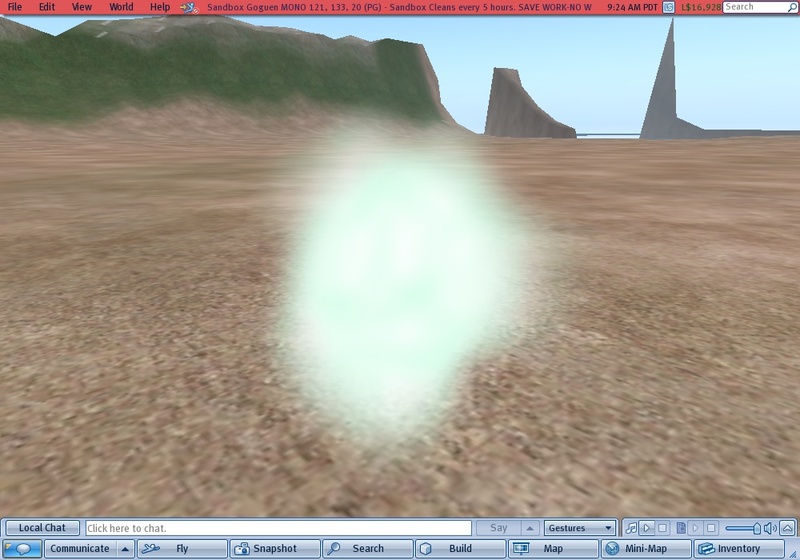 As a model it seems to me to have more in common with OpenSim’s hypergridding than with SL’s ‘continuous surface’ model. You’re right. It’s a very clever architectural design.